In front of our eyes, through migration, the transformation of the society has begun, by the leading financial elite of the planet, equipped with billions of banknotes. Of course, the decisions of so-called „Global governments” were never democratic and legitimate. The European continent faces a number of challenges, beginning with the 2008 economic crisis, which has continued to threaten to collapse the entire payment system, all the way to the migrant crisis, which escalates in 2015, triggering a storm of dissatisfaction and violence. Only 1.2 million people arrived in Europe last year, according to unofficial data, which has already caused demographic, security, economic, political and social shocks. The European Union’s policy on this issue is deeply divided, and many of its members have declared themselves and show that they do not want to accept refugees from Africa, Asia, and the Middle East. The official Brussels has failed the exam and has no solution to overcome the crisis. Most European citizens feel that behind the refugee wave there is the conspiracy of world powers, in order to achieve higher goals. Among them is the German journalist and publicist, Friederike Beck, chairman of the Society for International Peace Policy. In her research work, she primarily deals with the role of NGO networks, foundations in politics and in the modern (hybrid) war. Dear Mrs. Beck, a reader can find out in your book that a mass migration crisis has been initiated and organized by the global political and financial shadow government. Since when there is a plan to provoke a refugee wave and what is the name of their authors? – In my book, I tried to present this complex issue to the readers in the right way, so that it’s understandable for anyone who has not met with the world’s powerful centers to date. It’s about complex network structures at a very high level, whose approach you need to explain and show. There is a synergy of extremely wealthy foundations and associations of NGOs with decision-makers in the European Commission and key positions in the European Parliament, all of whom receive extensive assistance from the UN and sister UN organizations such as the International Organization for Migration (IOM) or Peter Sutherland (Peter Sutherland since 2006, Special Envoy for Migration at the UN), founder of the Global Forum for Migration and Development (GFMD). The Forum promotes migration, especially the structure of international cooperation, in implementing the international agenda priorities for migration and development. By mentioning the „Global Migration Group”, we are looking for the origin of the migration agenda and very close to its creators. „GFMD” is a global lobby group for migration. If you look carefully at its logo, you will notice it is next to well-known UN organizations, such as the „International Organization for Migration” and the World Bank. My book is a fundamental critique of globalization. It’s happening right in front of our eyes: the transformation of the society has begun through migration, by the leading financial elite of the planet, equipped with billions of banknotes. Of course, the decisions of so-called „Global governments” were never democratic and legitimate. It’s hard to say which names are in the whole global process at the top of the list, but there are important protagonists. My principle is to listen to their integral statements in order for them to expose themselves. Peter Landlord was seen as the godfather of globalization. The former Irish State Prosecutor has so far performed the following duties: European Commissioner for Financial Stability and the Capital Market; for years he has been in charge of „General Customs and Trade Agreements”; creator of the „World Trade Organization” and its first Director-General; he was being named „the father of globalization”; the leading eurocrat, responsible for the abolition of national currencies and the introduction of the euro, and Europe without borders; he is the Honorary President of the Transatlantic Policy Network, which initiated the „TTIP”; member of the Board of Directors „British petroleum”; 20 years in the „Gold & Sachs” committee; regular participant of the „Bilderberg Group”, European Committee of the „Trilateral Commission”; Vatican Advisor (real estate management); Member of the European Round Table; Special Envoy of the UN Secretary-General for International Migration. Now let’s hear what the influential representatives of the migration agenda said. On September 30, 2015. Peter Sutherland had a performance in the US „Foreign Relations Council”, where the participants of the event were representatives of the Think-tank („Brains trust” / Research Centers) scene, leading media people, scientists, representatives of NGOs and politicians. The topic of the meeting was a humanitarian concern and was called the „Global Response to the Mediterranean Migration Crisis”. Among the speakers was an American William Lacy Swing, managing director of the International Organization for Migration. At this meeting, William Lacy Swing asked Peter Sutherland: „Peter, you founded the WTO, because of the free movement of capital, goods, and services. What is the factor of everything? People! But there is still no free movement of people! And that’s the element you’re talking about, which is actually missing!” This brief quote brings the whole absurdity of the event to the heart of the story. In fact, it was a global response to the refugee crisis, which consisted of the acceptance of migrants by Germany, Austria, and Sweden, while the United States would not even find a „global” answer at all, that is – it would remain clean hands. You mentioned that the UN is one of the creators of the migration crisis. Can you describe in more detail the role of an organization that brings together 193 countries under its roof? – In my article, I quote UN Secretary-General Ban Ki-moon in a commentary on „Berliner Zeitung”, who can certainly be considered as a puppet of his adviser, Peter Sutherland: „Floscule is to say that we live in a global world. Little is known that globalization takes place in phases, and we are in the second, in the age of mobility, while the first phase, when the flow of capital and goods is liberalized, gave away all the benefits of globalization, especially to developed industrial countries and their trading partners, Brazil, China, and India, among them. As we enter the young age of mobility, people will move more and more across borders. „The UN Secretary-General summarizes briefly what this is actually about, and answers us at the same time as the length of the aspirations for the realization of migration of people. For the first phase of globalization, in the „liberation” of money and the flow of goods, the requirement was established in 1999 when US President Bill Clinton was in power, with the abolition of the banking system regulation (Glass-Steagall act). This measure was introduced in 1932 as a reaction to the Great Economic Crisis of 1929 and prohibited banks from participating in investment banking. Breaking this protective wall brings us to the 2008 banking crisis, which has continued to date, and, in 1995, a new step towards a free global trade was made by liberalizing products and goods flows, since Peter Sutherland transformed the general agreement on customs and trade GATT into the WTO. What is it about today? It seems to me that this is an analog introduction to the next phase of globalization, in the „global unbundling of the masses.” This term comes from me, and he, as an exceptionally similar, fell to my mind as I am trying to answer your question. Of course, global decision-makers do not make a decision this way, but, rather, talk about the „age of global mobility”. Finally, the goal is to liberalize the services sector around the world. Worldwide, global companies want to enter the future with the free flow of services, or the free access to people’s services, which provide services as cheaply as possible. Behind everything is a picture of a man as always accessible, constantly working, like a bee, who voluntarily moves across the continents. Again, I give you a quote from Ban Ki-moon: „Free movement of people helps to improve the world economy. When a hospital in London needs a nurse, it will recruit from Ghana or Sierra Leone. When Google searches for developers, it often happens that it finds it in developing countries. To date, this flow of people has largely given the advantage to wealthy countries and has provoked concern in developing countries over the outflow of highly qualified personnel. Therefore, the better the migration equality is established, the knowledge will spread evenly.” While officially advocating for humanity and humanity, the financial elite of our planet, in their insatiable greed, is preparing to speed up the wheel in which the people will now be thrown back on the blade. Ban Ki-moon’s promise that the migration equation for all functions is nothing but an empty phrase, that is, mantra. What is the role of the German government in the refugee crisis? Critically-minded citizens of your country say that the government in Berlin only meets the requirements of the global government. Is it really so? – Another example of a strange act by the leading creators of the whole idea is seen in the image of William Lacey Swing, the general manager of the „International Organization for Migration”. When in November 2015 Germany was left breathless of the uncontrolled influx of immigrants, a visit by the leading figures of the migration agenda to Germany’s Ministry of Foreign Affairs in Berlin took place. On November 4, German Foreign Minister Frank Valter Steinmeier, representatives of the IOM, the UN, and other high profile participants attended the roundtable. At a press conference after the meeting, Sving thanked Steinmeier for the political initiatives in the ongoing refugee crisis, and emphasized that „the international community has not only a duty but much more interest in promoting migration.” The term of the commitment was new and clarified what kind of pressure makes it to Germany from known global decision makers – Sving, Saterland, and others. The so-called International Community consists primarily of Germany because the United States did not even take the finger to accept the contingents of migrants such as Germany (in 2015 a total of 1.8-2 million people, no one knows how far today). Minister Steinmeier did not address the criticism at all but announced another noble payout: 75 million euros for the UNHCR and the World Food Program. Since 2011, Germany is clearly a premium partner for the IOM, because at that time a cooperation agreement between Swing and German Minister Thomas de Maiziere was signed, and since then Germany has been the largest IOM financier. Only from 2010 to 2013, the German government paid 66 million euros for these so-called „Migration projects”. Somewhere behind the scenes and almost completely unnoticed – NATO appears in the story. Does it represent a significant factor in the minds of globalists? Do I have to ask you – to what extent the European Union is involved in the migration wave? – NATO can certainly be mentioned, however, under the name of „absurdity”. As far – NATO can certainly be mentioned, however, under the name of „absurdity”.as the European Union is concerned, it should have created multinational maritime forces in cooperation with Frontex and the existing educational opportunities, which would send a strong signal to Erdogan, the migrants and the „mafia” that it is almost with dishonest actions. In this case, asylum would only be accepted in embassies and consulates of the countries of origin. Instead, Angela Merkel, to the surprise of many, this year, puts NATO into the game, in my opinion, to provide a better starting position for surveillance and scouting in Syrian war events, especially against Russia in the eastern Mediterranean. The EU clearly manages its policy to respond to global decision-makers, and it has three prominent aspects. 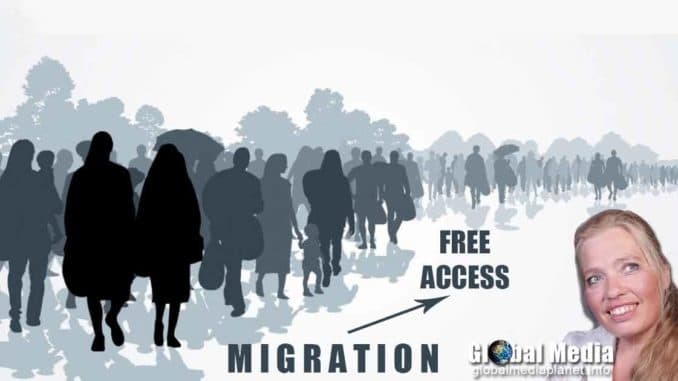 First of all, it supports the migration narrative of the global financial elite, and it also works on the free flow of people and sees in migration a great opportunity to abolish sovereignty to the disadvantaged nation-states (or what is left of them). The key phrase here is „integration through migration”, that is, more power for Brussels, more EU integration, and more power for decision-makers. In this context, the EU’s leading elite in this context, simply and decisively, through migration and mobility partnerships, with various African and North African countries, allowed Europe to settle. Above all – there is greed. In the future, the EU agency in Malta should decide how many migrants must accept EU members, otherwise, they will be sanctioned. Since the 1990s, the EU has been working on the so-called „Barcelona Process”, which represents the merging of the two sides of the Mediterranean into a single free trade zone, which is increasingly integrated into the political arena. This would then be a European-North African-Arab-Turkish great empire (inclusive, 3 million Turks only in Germany). Take, for example, the Euro-Mediterranean contract „Euromed”. It was not just a bold plan. No, the partnership was launched in 1995 at the Euro-Mediterranean Conference of EU Foreign Ministers and partner countries in Barcelona (hence the „Barcelona Process”). That same year, the Mediterranean region of the EU was declared a region of strategic importance. Parliamentary assembly „Union for the Mediterranean” was constituted in March 2004, entitled „Euro-Mediterranean Parliamentary Assembly”, which means that we have structures for everything that is visible, and this is a further aspect: one move would make the population of this area, and therefore the number of consumers, to be increased multiple times, because in Europe, as it is known, the population stagnates or disappears. George Soros was repeatedly labeled as a person who, together with his like-minded people, organized mass migration behind the scenes in every sense. What did your research show? – According to the 2014 Oxam study, 85 richest people on the planet have a wealth of as many as 3.5 billion people, that is, half the world’s population. Among them is George Soros, whose fortune, with monetary speculation, is estimated at about $24.2 billion. He is a special hyperactive creator of globalism. Every year it gives about one billion dollars for its own projects. Soros also has very rich foundations on his side, following the same goals I have proved in the book. All these global designers consider that mass migration in Germany and Europe is a great deal, and that is already time-consuming. Because Soros Foundation „Open Society Foundations” has established, along with other rich foundations, the foundation association „EPIM” („European Program for Integration and Migration”). With this very strong financial structure in the background, Soros began, as if to some extent the brain of the entire operation, to pay money to NGOs and „Grass-roots” (a term that signifies public or political activism and the organization of broad social layers). These organizations, from the left to the left of the extreme political spectrum, scroll slogans „There are no borders, no nations,” or „No man is illegal”, perfectly correspond to the migration agenda of global decision-makers, and since then they have been systematically built up. Many business activists are employed in Soros and similar financial structures. Soros has a staff headquarters, from a lawyer who has to invent new migration strategies, to a migration service or an activist at the base. You can permanently, as a private person, apply for open positions, or apply with your organization to claim the cash. In one business form, in English, „Program Officer, Migration, and Open Society Initiative for Europe” is required. According to the announcement, the future activity of Soros’s employee can be described as follows: „New jobs! Sign up now! For example, as a migration programmer, the future activity will be the financial support of a civil society organization. The staff will be part of the „Open Society Initiative for Europe” migration team and will work on migration and inclusion activities. The main work focuses on the expenditure of donations to civil society organizations in order to create political supporters and alliances, and from time to time to carry out political lobbying in certain countries.” This alliance, between indecisively rich financial elite and left-wing, will be remembered as one of the most important in political history. In addition, there is something else that happens in Germany, quite specifically. Namely, migrants are activists and so-called „Benefactors” are used as a projection space. This neurotic mechanism allows such people, who are defined as anti-fascists and anti-racists, killing, allegedly, Hitler „in themselves and in others”, proof that this time is on the right side. Tragically, many of these people, who are the ideal idealists, have become the ground troops of the new phase of globalization, without even noticing it. However, the question is the day when it comes to knowing. In the past year, the NGO structures, which over the last ten years were heavily assisted by the „EPIM”, came to their destination because different organizations were installed (and still are) installed in the Balkan route, which almost planned to destroy the „fortress Europe „. The diverse digital capabilities that migrants have (all are supplied with smartphones) have brought them the perfect migration infrastructure, such as the so-called. Live ticker, at many border crossings in the Balkan route, is constantly updated and gives accurate information on what all migrants expect, how to solve problems and how to behave. For this kind of process, I made the term „supervisory escape”. Please explain how all the organizations, which are working on the implementation of the migration agenda, are linked. – „EPIM” foundation, in the coalition with other similar organizations and foundations, wants to influence politics. Since the beginning of 2005, following the Lisbon Treaty, EU members have surrendered more and more national powers to Brussels, the foundations have decided to actively lobby decision-making in Brussels and form a migration and asylum policy at the local level. In an interesting way, according to the influence of the work and description of the techniques, the policies of the decision-makers of the EU and parliamentarians, the Eastern European Organization PASOS – is the direct outcome of the European Open Society Institute. This foundation was founded in 2004, in accordance with the Czech law, and its headquarters are in Prague, and the director is Jeff Lovitt. PASOS has 56 member organizations and has a political lobby for policy-making in national and European frameworks, as well as with international organizations, at the same time has a strong influence in Eastern Europe, and promotes Europe of unhindered migration, without visas and borders. Piotr Kaźmierkiewicz, a political instructor of PASOS, describes in a very detailed and practical manner how political lobbying should be carried out in favor of unlimited migration: „We are confronted at many levels with confrontations with the reality of EU governance, and in any case Is not an easy task: EU officials should be chosen, controlled and influenced by the main decision-makers and the public of the EU member states.” Kaźmierkiewicz gives concrete suggestions where and how migration lobbyists should approach the work: „European Parliament committees set a natural passage for the efforts of the lobby because they make legislative changes based on the proposal of the commission, which then represents a plenum to vote. For lobby groups, the contact person in the Committee is the draft bill rapporteur, who will be appointed when the proposed proposals are submitted to Parliament. It is also good to contact the members of the group who share the views and objectives of the group’s lobby or are at least closely related to them. Members of the European Parliament are essentially very open to cooperation with civil society organizations.” And for influence at the highest level of government, Kaźmierkiewicz has a ready-made advice: „Cabinet ministers, prime ministers, and presidents (depending on the political system) can be especially supported by Think-tanks and research institutes with analytical capacity by working in parallel with government analysts. In this way, civil society groups can provide public political analyzes in parallel for providing available resources and planning activities …” However, Soros and his „EPIM” initiative did not just build a powerful network and lobby the empire, but they practically directly launched think-tank in Brussels; it is the „Center for European Policy” (EPC). This „trust of the brains”, with a sumptuous annual budget of 2.16 million euros (2014), submits to NGOs intellectuals, subtly, under the hand, and submits them documents, solutions, and slogans. In my book, I give a well-documented comprehensive overview of these and other machinations, and may you understand that I can only select a few aspects in the context of this conversation. I would like my book to be translated into English and Russian. Please describe how the migration route from Africa, Asia, and the Middle East is organized, until its arrival in Europe. Could the security services not prevent the preparation of the plan for the realization of the refugee wave? – It’s best not to describe migration routes but simply look at the maps that different organizations offer. Basically, it can be said that Italian investigators have a high percentage of investigation of the events. What is particularly worrying is that the „Islamic state” and its people in the background of migration have been identified as a source of income, more attractive even than drugs, which can be lost in transit, while, for example, the migrant could drown while crossing, and the smuggler has already been paid couple of thousands of dollars. In 2010, a confidential internal analysis of the state of internal security in the EU was published, The Joint Report, compiled by Europol, Eurojust, and Frontex (EU police, judicial authorities, and European border agencies) with 900,000 illegal migrants who come to the EU every year. The document reads: „The security of the borders is endangered by groups exploiting the weaknesses of the transport sector, also through corruption and the use of forgery, forged and false documents, which are an indispensable means of illegal migration, human trafficking, false identity, and terrorism.” I repeat that was in May 2010! This analysis was a secret, hidden from the citizens of Europe, in order to continue with the migration agenda, so that in 2015, during the so-called refugee crisis, the crown of everything was the astonishment with the events! There is no doubt that the refugee crisis brings a great deal of financial gain for interest groups and individuals. Are their names known? – These are, in Germany, large „charity” associations, which, during the refugee wave, with the taxpayers’ money pay the food and accommodation costs to asylum seekers and migrants. There is an economist’s account that the costs of migrant integration in the coming years will amount to about 1 trillion euros. The profits of those who provide international services and exploit them are hard to imagine. At least 72% of migrants are men between 20 and 35 years old, almost all of them are Muslims, many of them radical Islamists, IS members. The refugee crisis of hundreds of thousands of people does not end. Do you share the opinion that Europe is threatened by demographic and cultural destruction? – Reporting in Germany on this subject has spilled over, and it is already believed that the problem has been solved. Not at all. The borders are open, there are several police officers on the highways, and on the side roads, each passenger can see migrants. I am really convinced, especially with the knowledge I gained through research for my book that Germany and the rest of Europe are in danger. Global factors and their representatives in Brussels, Berlin and other European metropolises, have committed a betrayal. They must be brought to justice and punished. Nothing more, nothing less. We must start thinking as quickly as possible to free ourselves of the completely corrupt EU elite in Brussels and their unbearable involvement with the super-rich foundations, financial circles, hedge funds, US research institutes, and NGOs. The number of violent delicts in European countries has exploded since governments allowed the entry of millions of migrants. Criminals are minimized by the authorities, obviously in order to avoid repulsion towards migrants. During this time, the population lives in fear of potential terrorist attacks and Islamization of society. How justified are such fears? – Everyone knows that violence is on the rise and at the same time there is a great interest of the authorities to conceal the problem, so as not to strengthen populist tendencies. The main problem is that every citizen of Germany must be transparent, for example, in the tax administration, and that, for example, before entering the health insurance, he must provide a series of documents and evidence, while on the other hand no one actually knows who is coming or who will come with us. False passports, missing, unoccupied, without precise data. Of course, fear is present. At the end of the conversation, I would ask you if you think there is a solution to a migration crisis that does not end. – Yes. 1. Application of existing laws. 2. Change in asylum legislation so that asylum procedures can be submitted only in the country of origin in the appropriate embassies and consulates to the countries of destination. As a result: there are no more trips across the Mediterranean. 3. Multinational maritime forces, together with the existing technical capabilities of the EU Border Protection Agency, should close the Mediterranean Sea, thus sending a clear signal to Erdogan, the whip-mafia and the migrants themselves. Consequential return of all intercepted on their shores. 4. Consistent application of existing deportation laws. 5. Until the further consistent implementation of border control. 6. A voluntary return within the „golden handshake” program, which serves as a reconstruction measure for destroyed infrastructure in many countries of origin of migrants, as well as the promotion of economic development and peace-building. 7. Change in Europe’s economic and foreign policy (unthinkable within the EU). The further away from free trade towards the economically weak African countries, which is responsible for the final outcome of migration, and the hands away from the destabilization of North Africa and the Middle East for the benefit of the United States.